Type your learning objectives here. List the rules for ray tracking for thin lenses. Illustrate the formation of images using the technique of ray tracking. Determine power of a lens given the focal length. Lenses are found in a huge array of optical instruments, ranging from a simple magnifying glass to the eye to a camera’s zoom lens. In this section, we will use the law of refraction to explore the properties of lenses and how they form images. The word lens derives from the Latin word for a lentil bean, the shape of which is similar to the convex lens in Figure 1. The convex lens shown has been shaped so that all light rays that enter it parallel to its axis cross one another at a single point on the opposite side of the lens. 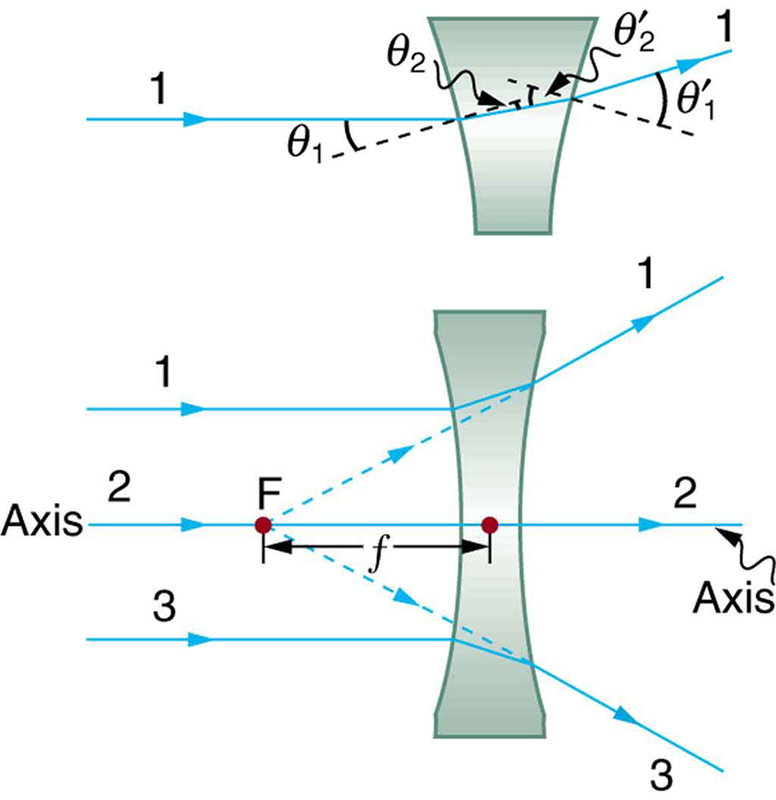 (The axis is defined to be a line normal to the lens at its center, as shown in Figure 1.) 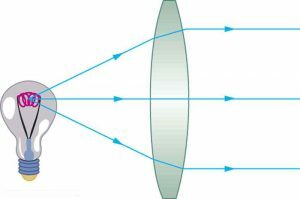 Such a lens is called a converging (or convex) lens for the converging effect it has on light rays. An expanded view of the path of one ray through the lens is shown, to illustrate how the ray changes direction both as it enters and as it leaves the lens. Since the index of refraction of the lens is greater than that of air, the ray moves towards the perpendicular as it enters and away from the perpendicular as it leaves. (This is in accordance with the law of refraction.) Due to the lens’s shape, light is thus bent toward the axis at both surfaces. The point at which the rays cross is defined to be the focal point F of the lens. The distance from the center of the lens to its focal point is defined to be the focal lengthf of the lens. Figure 2 shows how a converging lens, such as that in a magnifying glass, can converge the nearly parallel light rays from the sun to a small spot. Figure 1. Rays of light entering a converging lens parallel to its axis converge at its focal point F. (Ray 2 lies on the axis of the lens.) The distance from the center of the lens to the focal point is the lens’s focal length f. An expanded view of the path taken by ray 1 shows the perpendiculars and the angles of incidence and refraction at both surfaces. The lens in which light rays that enter it parallel to its axis cross one another at a single point on the opposite side with a converging effect is called converging lens. The point at which the light rays cross is called the focal point F of the lens. The distance from the center of the lens to its focal point is called focal length . Figure 2. Sunlight focused by a converging magnifying glass can burn paper. Light rays from the sun are nearly parallel and cross at the focal point of the lens. The more powerful the lens, the closer to the lens the rays will cross. where is the focal length of the lens, which must be given in meters (and not cm or mm). The power of a lens has the unit diopters (D), provided that the focal length is given in meters. That is, , or . (Note that this power (optical power, actually) is not the same as power in watts defined in Chapter 7 Work, Energy, and Energy Resources. It is a concept related to the effect of optical devices on light.) Optometrists prescribe common spectacles and contact lenses in units of diopters. Example 1: What is the Power of a Common Magnifying Glass? 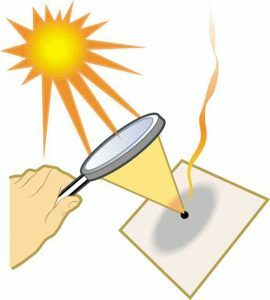 Suppose you take a magnifying glass out on a sunny day and you find that it concentrates sunlight to a small spot 8.00 cm away from the lens. What are the focal length and power of the lens? The situation here is the same as those shown in Figure 1 and Figure 2. The Sun is so far away that the Sun’s rays are nearly parallel when they reach Earth. The magnifying glass is a convex (or converging) lens, focusing the nearly parallel rays of sunlight. Thus the focal length of the lens is the distance from the lens to the spot, and its power is the inverse of this distance (in m). This is a relatively powerful lens. The power of a lens in diopters should not be confused with the familiar concept of power in watts. It is an unfortunate fact that the word “power” is used for two completely different concepts. If you examine a prescription for eyeglasses, you will note lens powers given in diopters. If you examine the label on a motor, you will note energy consumption rate given as a power in watts. Figure 3 shows a concave lens and the effect it has on rays of light that enter it parallel to its axis (the path taken by ray 2 in the figure is the axis of the lens). The concave lens is a diverging lens, because it causes the light rays to bend away (diverge) from its axis. In this case, the lens has been shaped so that all light rays entering it parallel to its axis appear to originate from the same point, , defined to be the focal point of a diverging lens. The distance from the center of the lens to the focal point is again called the focal length of the lens. Note that the focal length and power of a diverging lens are defined to be negative. 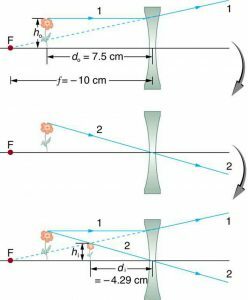 For example, if the distance to in Figure 3 is 5.00 cm, then the focal length is and the power of the lens is . An expanded view of the path of one ray through the lens is shown in the figure to illustrate how the shape of the lens, together with the law of refraction, causes the ray to follow its particular path and be diverged. Figure 3. Rays of light entering a diverging lens parallel to its axis are diverged, and all appear to originate at its focal point F. The dashed lines are not rays—they indicate the directions from which the rays appear to come. 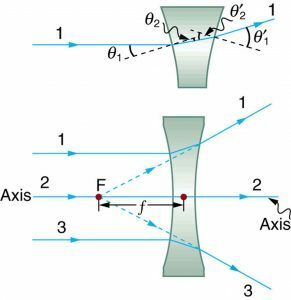 The focal length f of a diverging lens is negative. An expanded view of the path taken by ray 1 shows the perpendiculars and the angles of incidence and refraction at both surfaces. A lens that causes the light rays to bend away from its axis is called a diverging lens. As noted in the initial discussion of the law of refraction in Chapter 25.3 The Law of Refraction, the paths of light rays are exactly reversible. This means that the direction of the arrows could be reversed for all of the rays in Figure 1 and Figure 3. For example, if a point light source is placed at the focal point of a convex lens, as shown in Figure 4, parallel light rays emerge from the other side. Figure 4. A small light source, like a light bulb filament, placed at the focal point of a convex lens, results in parallel rays of light emerging from the other side. The paths are exactly the reverse of those shown in Figure 1. This technique is used in lighthouses and sometimes in traffic lights to produce a directional beam of light from a source that emits light in all directions. Ray tracing is the technique of determining or following (tracing) the paths that light rays take. For rays passing through matter, the law of refraction is used to trace the paths. Here we use ray tracing to help us understand the action of lenses in situations ranging from forming images on film to magnifying small print to correcting nearsightedness. 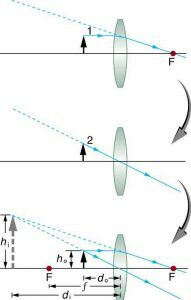 While ray tracing for complicated lenses, such as those found in sophisticated cameras, may require computer techniques, there is a set of simple rules for tracing rays through thin lenses. 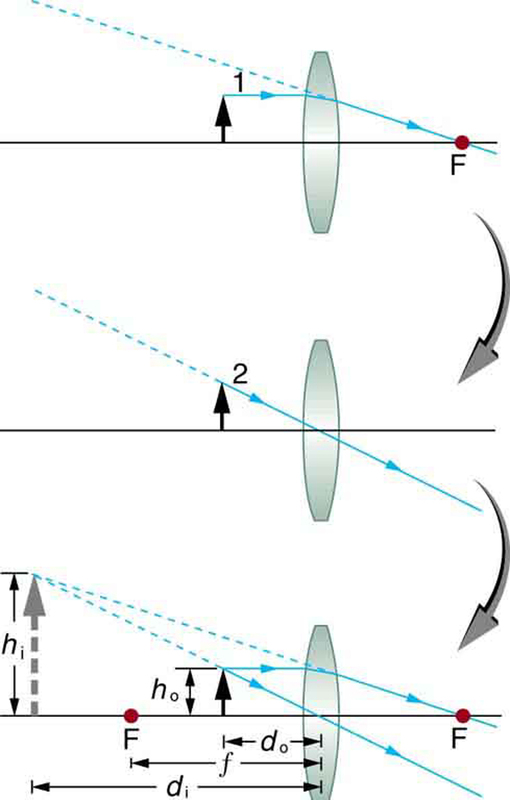 A thin lens is defined to be one whose thickness allows rays to refract, as illustrated in Figure 1, but does not allow properties such as dispersion and aberrations. An ideal thin lens has two refracting surfaces but the lens is thin enough to assume that light rays bend only once. A thin symmetrical lens has two focal points, one on either side and both at the same distance from the lens. (See Figure 5.) 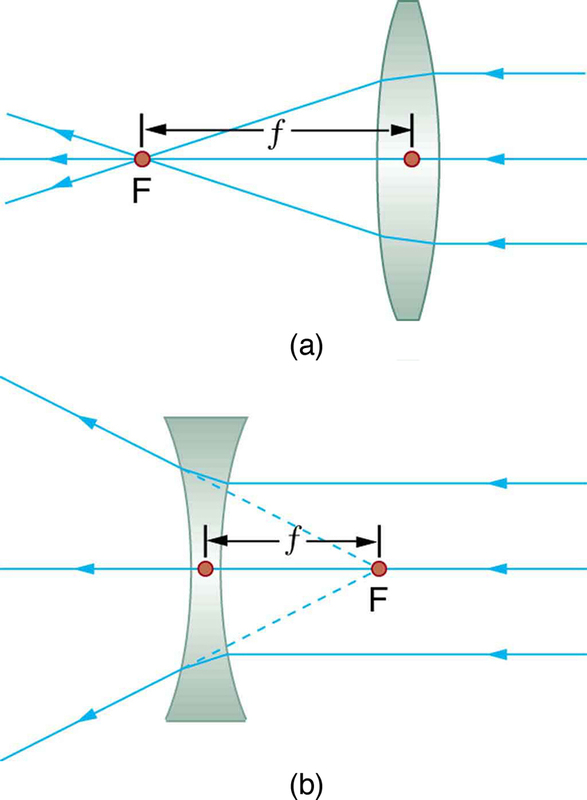 Another important characteristic of a thin lens is that light rays through its center are deflected by a negligible amount, as seen in Figure 6. A thin lens is defined to be one whose thickness allows rays to refract but does not allow properties such as dispersion and aberrations. Look through your eyeglasses (or those of a friend) backward and forward and comment on whether they act like thin lenses. Figure 5. Thin lenses have the same focal length on either side. (a) Parallel light rays entering a converging lens from the right cross at its focal point on the left. (b) Parallel light rays entering a diverging lens from the right seem to come from the focal point on the right. Figure 6. The light ray through the center of a thin lens is deflected by a negligible amount and is assumed to emerge parallel to its original path (shown as a shaded line). A ray entering a converging lens parallel to its axis passes through the focal point F of the lens on the other side. A ray entering a diverging lens parallel to its axis seems to come from the focal point F.
A ray passing through the center of either a converging or a diverging lens does not change direction. A ray entering a converging lens through its focal point exits parallel to its axis. A ray that enters a diverging lens by heading toward the focal point on the opposite side exits parallel to the axis. In some circumstances, a lens forms an obvious image, such as when a movie projector casts an image onto a screen. In other cases, the image is less obvious. Where, for example, is the image formed by eyeglasses? 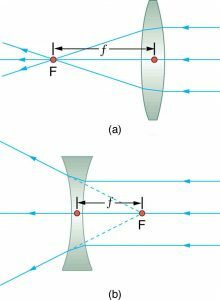 We will use ray tracing for thin lenses to illustrate how they form images, and we will develop equations to describe the image formation quantitatively. 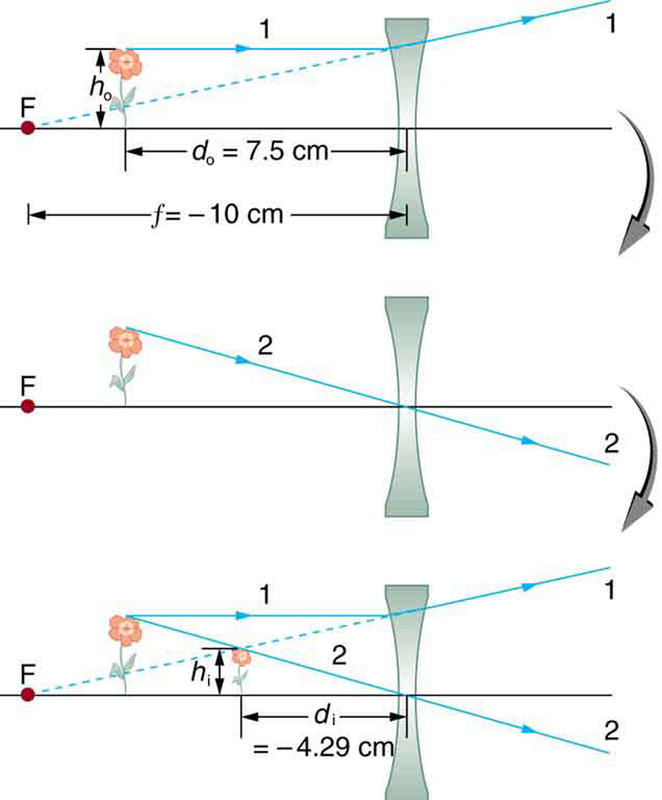 Consider an object some distance away from a converging lens, as shown in Figure 7. To find the location and size of the image formed, we trace the paths of selected light rays originating from one point on the object, in this case the top of the person’s head. The figure shows three rays from the top of the object that can be traced using the ray tracing rules given above. (Rays leave this point going in many directions, but we concentrate on only a few with paths that are easy to trace.) The first ray is one that enters the lens parallel to its axis and passes through the focal point on the other side (rule 1). The second ray passes through the center of the lens without changing direction (rule 3). The third ray passes through the nearer focal point on its way into the lens and leaves the lens parallel to its axis (rule 4). The three rays cross at the same point on the other side of the lens. The image of the top of the person’s head is located at this point. All rays that come from the same point on the top of the person’s head are refracted in such a way as to cross at the point shown. Rays from another point on the object, such as her belt buckle, will also cross at another common point, forming a complete image, as shown. Although three rays are traced in Figure 7, only two are necessary to locate the image. It is best to trace rays for which there are simple ray tracing rules. Before applying ray tracing to other situations, let us consider the example shown in Figure 7 in more detail. Figure 7. Ray tracing is used to locate the image formed by a lens. Rays originating from the same point on the object are traced—the three chosen rays each follow one of the rules for ray tracing, so that their paths are easy to determine. The image is located at the point where the rays cross. In this case, a real image—one that can be projected on a screen—is formed. The image formed in Figure 7 is a real image, meaning that it can be projected. That is, light rays from one point on the object actually cross at the location of the image and can be projected onto a screen, a piece of film, or the retina of an eye, for example. Figure 8 shows how such an image would be projected onto film by a camera lens. 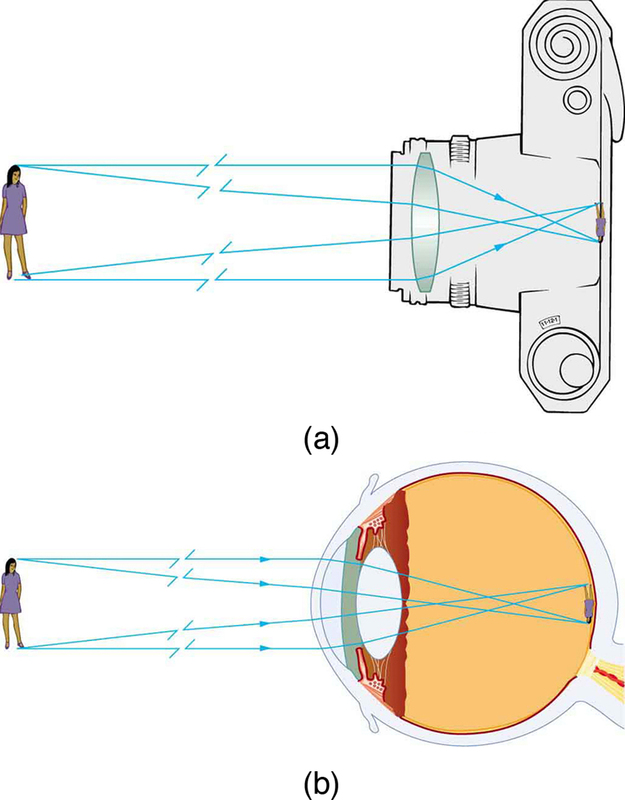 This figure also shows how a real image is projected onto the retina by the lens of an eye. Note that the image is there whether it is projected onto a screen or not. The image in which light rays from one point on the object actually cross at the location of the image and can be projected onto a screen, a piece of film, or the retina of an eye is called a real image. Figure 8. Real images can be projected. (a) A real image of the person is projected onto film. (b) The converging nature of the multiple surfaces that make up the eye result in the projection of a real image on the retina. We define the ratio of image height to object height ( ) to be the magnification . (The minus sign in the equation above will be discussed shortly.) The thin lens equations are broadly applicable to all situations involving thin lenses (and “thin” mirrors, as we will see later). We will explore many features of image formation in the following worked examples. The distance of the image from the center of the lens is called image distance. A clear glass light bulb is placed 0.750 m from a convex lens having a 0.500 m focal length, as shown in Figure 9. Use ray tracing to get an approximate location for the image. Then use the thin lens equations to calculate (a) the location of the image and (b) its magnification. Verify that ray tracing and the thin lens equations produce consistent results. Figure 9. A light bulb placed 0.750 m from a lens having a 0.500 m focal length produces a real image on a poster board as discussed in the example above. Ray tracing predicts the image location and size. Since the object is placed farther away from a converging lens than the focal length of the lens, this situation is analogous to those illustrated in Figure 7 and Figure 8. Ray tracing to scale should produce similar results for didi. Numerical solutions for didi and mm can be obtained using the thin lens equations, noting that and . The ray tracing to scale in Figure 9 shows two rays from a point on the bulb’s filament crossing about 1.50 m on the far side of the lens. Thus the image distance is about 1.50 m. Similarly, the image height based on ray tracing is greater than the object height by about a factor of 2, and the image is inverted. Thus mm is about –2. The minus sign indicates that the image is inverted. Note that there is no inverting here. Note that the minus sign causes the magnification to be negative when the image is inverted. Ray tracing and the use of the thin lens equations produce consistent results. The thin lens equations give the most precise results, being limited only by the accuracy of the given information. Ray tracing is limited by the accuracy with which you can draw, but it is highly useful both conceptually and visually. A different type of image is formed when an object, such as a person’s face, is held close to a convex lens. 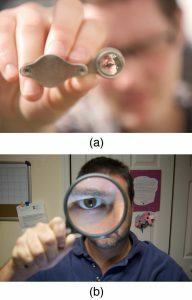 The image is upright and larger than the object, as seen in Figure 10(b), and so the lens is called a magnifier. If you slowly pull the magnifier away from the face, you will see that the magnification steadily increases until the image begins to blur. Pulling the magnifier even farther away produces an inverted image as seen in Figure 10(a). The distance at which the image blurs, and beyond which it inverts, is the focal length of the lens. To use a convex lens as a magnifier, the object must be closer to the converging lens than its focal length. This is called a case 2 image. A case 2 image is formed when and is positive. Figure 11 uses ray tracing to show how an image is formed when an object is held closer to a converging lens than its focal length. Rays coming from a common point on the object continue to diverge after passing through the lens, but all appear to originate from a point at the location of the image. The image is on the same side of the lens as the object and is farther away from the lens than the object. This image, like all case 2 images, cannot be projected and, hence, is called a virtual image. Light rays only appear to originate at a virtual image; they do not actually pass through that location in space. A screen placed at the location of a virtual image will receive only diffuse light from the object, not focused rays from the lens. Additionally, a screen placed on the opposite side of the lens will receive rays that are still diverging, and so no image will be projected on it. We can see the magnified image with our eyes, because the lens of the eye converges the rays into a real image projected on our retina. Finally, we note that a virtual image is upright and larger than the object, meaning that the magnification is positive and greater than 1. Figure 11. Ray tracing predicts the image location and size for an object held closer to a converging lens than its focal length. Ray 1 enters parallel to the axis and exits through the focal point on the opposite side, while ray 2 passes through the center of the lens without changing path. The two rays continue to diverge on the other side of the lens, but both appear to come from a common point, locating the upright, magnified, virtual image. This is a case 2 image. An image that is on the same side of the lens as the object and cannot be projected on a screen is called a virtual image. Suppose the book page in Figure 11 (a) is held 7.50 cm from a convex lens of focal length 10.0 cm, such as a typical magnifying glass might have. What magnification is produced? We are given that and , so we have a situation where the object is placed closer to the lens than its focal length. We therefore expect to get a case 2 virtual image with a positive magnification that is greater than 1. Ray tracing produces an image like that shown in Figure 11, but we will use the thin lens equations to get numerical solutions in this example. A number of results in this example are true of all case 2 images, as well as being consistent with Figure 11. Magnification is indeed positive (as predicted), meaning the image is upright. The magnification is also greater than 1, meaning that the image is larger than the object—in this case, by a factor of 4. Note that the image distance is negative. This means the image is on the same side of the lens as the object. Thus the image cannot be projected and is virtual. (Negative values of occur for virtual images.) The image is farther from the lens than the object, since the image distance is greater in magnitude than the object distance. The location of the image is not obvious when you look through a magnifier. In fact, since the image is bigger than the object, you may think the image is closer than the object. But the image is farther away, a fact that is useful in correcting farsightedness, as we shall see in a later section. A third type of image is formed by a diverging or concave lens. Try looking through eyeglasses meant to correct nearsightedness. (See Figure 12.) You will see an image that is upright but smaller than the object. This means that the magnification is positive but less than 1. The ray diagram in Figure 13 shows that the image is on the same side of the lens as the object and, hence, cannot be projected—it is a virtual image. Note that the image is closer to the lens than the object. This is a case 3 image, formed for any object by a negative focal length or diverging lens. Figure 13. Ray tracing predicts the image location and size for a concave or diverging lens. Ray 1 enters parallel to the axis and is bent so that it appears to originate from the focal point. Ray 2 passes through the center of the lens without changing path. The two rays appear to come from a common point, locating the upright image. This is a case 3 image, which is closer to the lens than the object and smaller in height. Suppose an object such as a book page is held 7.50 cm from a concave lens of focal length –10.0 cm. Such a lens could be used in eyeglasses to correct pronounced nearsightedness. What magnification is produced? This example is identical to the preceding one, except that the focal length is negative for a concave or diverging lens. The method of solution is thus the same, but the results are different in important ways. A number of results in this example are true of all case 3 images, as well as being consistent with Figure 13. Magnification is positive (as predicted), meaning the image is upright. The magnification is also less than 1, meaning the image is smaller than the object—in this case, a little over half its size. The image distance is negative, meaning the image is on the same side of the lens as the object. (The image is virtual.) The image is closer to the lens than the object, since the image distance is smaller in magnitude than the object distance. The location of the image is not obvious when you look through a concave lens. In fact, since the image is smaller than the object, you may think it is farther away. But the image is closer than the object, a fact that is useful in correcting nearsightedness, as we shall see in a later section. Table 3 summarizes the three types of images formed by single thin lenses. These are referred to as case 1, 2, and 3 images. Convex (converging) lenses can form either real or virtual images (cases 1 and 2, respectively), whereas concave (diverging) lenses can form only virtual images (always case 3). Real images are always inverted, but they can be either larger or smaller than the object. For example, a slide projector forms an image larger than the slide, whereas a camera makes an image smaller than the object being photographed. Virtual images are always upright and cannot be projected. Virtual images are larger than the object only in case 2, where a convex lens is used. The virtual image produced by a concave lens is always smaller than the object—a case 3 image. We can see and photograph virtual images only by using an additional lens to form a real image. In Chapter 25.7 Image Formation by Mirrors, we shall see that mirrors can form exactly the same types of images as lenses. Find several lenses and determine whether they are converging or diverging. In general those that are thicker near the edges are diverging and those that are thicker near the center are converging. On a bright sunny day take the converging lenses outside and try focusing the sunlight onto a piece of paper. Determine the focal lengths of the lenses. Be careful because the paper may start to burn, depending on the type of lens you have selected. Step 1. Examine the situation to determine that image formation by a lens is involved. Step 2. Determine whether ray tracing, the thin lens equations, or both are to be employed. A sketch is very useful even if ray tracing is not specifically required by the problem. Write symbols and values on the sketch. Step 3. Identify exactly what needs to be determined in the problem (identify the unknowns). Step 4. Make a list of what is given or can be inferred from the problem as stated (identify the knowns). It is helpful to determine whether the situation involves a case 1, 2, or 3 image. While these are just names for types of images, they have certain characteristics (given in Table 3) that can be of great use in solving problems. Step 5. If ray tracing is required, use the ray tracing rules listed near the beginning of this section. Step 6. Most quantitative problems require the use of the thin lens equations. These are solved in the usual manner by substituting knowns and solving for unknowns. Several worked examples serve as guides. Step 7. Check to see if the answer is reasonable: Does it make sense? If you have identified the type of image (case 1, 2, or 3), you should assess whether your answer is consistent with the type of image, magnification, and so on. We do not realize that light rays are coming from every part of the object, passing through every part of the lens, and all can be used to form the final image. We generally feel the entire lens, or mirror, is needed to form an image. Actually, half a lens will form the same, though a fainter, image. Light rays entering a converging lens parallel to its axis cross one another at a single point on the opposite side. For a converging lens, the focal point is the point at which converging light rays cross; for a diverging lens, the focal point is the point from which diverging light rays appear to originate. The distance from the center of the lens to its focal point is called the focal length . Power of a lens is defined to be the inverse of its focal length, . Ray tracing is the technique of graphically determining the paths that light rays take. Thin lens equations are and (magnification). 1: It can be argued that a flat piece of glass, such as in a window, is like a lens with an infinite focal length. If so, where does it form an image? That is, how are and related? 2: You can often see a reflection when looking at a sheet of glass, particularly if it is darker on the other side. Explain why you can often see a double image in such circumstances. 3: When you focus a camera, you adjust the distance of the lens from the film. If the camera lens acts like a thin lens, why can it not be a fixed distance from the film for both near and distant objects? 4: A thin lens has two focal points, one on either side, at equal distances from its center, and should behave the same for light entering from either side. 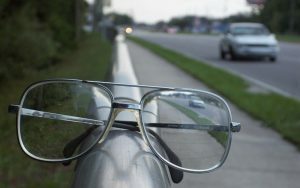 Look through your eyeglasses (or those of a friend) backward and forward and comment on whether they are thin lenses. 5: Will the focal length of a lens change when it is submerged in water? Explain. 1: What is the power in diopters of a camera lens that has a 50.0 mm focal length? 2: Your camera’s zoom lens has an adjustable focal length ranging from 80.0 to 200 mm. What is its range of powers? 3: What is the focal length of 1.75 D reading glasses found on the rack in a pharmacy? 4: You note that your prescription for new eyeglasses is –4.50 D. What will their focal length be? 5: How far from the lens must the film in a camera be, if the lens has a 35.0 mm focal length and is being used to photograph a flower 75.0 cm away? Explicitly show how you follow the steps in the Problem-Solving Strategy for lenses. 6: A certain slide projector has a 100 mm focal length lens. (a) How far away is the screen, if a slide is placed 103 mm from the lens and produces a sharp image? (b) If the slide is 24.0 by 36.0 mm, what are the dimensions of the image? Explicitly show how you follow the steps in the Problem-Solving Strategy for lenses. 7: A doctor examines a mole with a 15.0 cm focal length magnifying glass held 13.5 cm from the mole (a) Where is the image? (b) What is its magnification? (c) How big is the image of a 5.00 mm diameter mole? 8: How far from a piece of paper must you hold your father’s 2.25 D reading glasses to try to burn a hole in the paper with sunlight? 9: A camera with a 50.0 mm focal length lens is being used to photograph a person standing 3.00 m away. (a) How far from the lens must the film be? (b) If the film is 36.0 mm high, what fraction of a 1.75 m tall person will fit on it? (c) Discuss how reasonable this seems, based on your experience in taking or posing for photographs. 10: A camera lens used for taking close-up photographs has a focal length of 22.0 mm. The farthest it can be placed from the film is 33.0 mm. (a) What is the closest object that can be photographed? (b) What is the magnification of this closest object? 11: Suppose your 50.0 mm focal length camera lens is 51.0 mm away from the film in the camera. (a) How far away is an object that is in focus? (b) What is the height of the object if its image is 2.00 cm high? 12: (a) What is the focal length of a magnifying glass that produces a magnification of 3.00 when held 5.00 cm from an object, such as a rare coin? (b) Calculate the power of the magnifier in diopters. (c) Discuss how this power compares to those for store-bought reading glasses (typically 1.0 to 4.0 D). Is the magnifier’s power greater, and should it be? 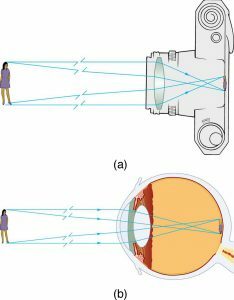 13: What magnification will be produced by a lens of power –4.00 D (such as might be used to correct myopia) if an object is held 25.0 cm away? 14: In Example 3, the magnification of a book held 7.50 cm from a 10.0 cm focal length lens was found to be 3.00. (a) Find the magnification for the book when it is held 8.50 cm from the magnifier. (b) Do the same for when it is held 9.50 cm from the magnifier. (c) Comment on the trend in m as the object distance increases as in these two calculations. 15: Suppose a 200 mm focal length telephoto lens is being used to photograph mountains 10.0 km away. (a) Where is the image? (b) What is the height of the image of a 1000 m high cliff on one of the mountains? 16: A camera with a 100 mm focal length lens is used to photograph the sun and moon. What is the height of the image of the sun on the film, given the sun is in diameter and is away? 17: Combine thin lens equations to show that the magnification for a thin lens is determined by its focal length and the object distance and is given by . 7: (a) (on the object side of the lens). (c) The magnification increases without limit (to infinity) as the object distance increases to the limit of the focal distance. 25.6 Image Formation by Lenses by OpenStax is licensed under a Creative Commons Attribution 4.0 International License, except where otherwise noted.